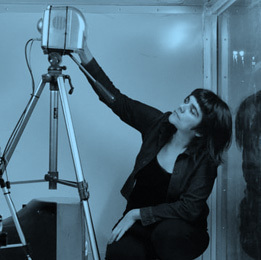 Bárbara González’ work is presented as a sound-visual assembly in constant experimentation and reconstruction, using multiple objects that connect to address space / time relationships. She performs actions under choreographic scores which are open to improvisation where her body works as a component more and as flow activator of mechanisms. She has presented her investigation Acción Rizoma for more than ten years in different formats and artistic circuits, participating in Festivals of Sound Art, Experimental and Electroacoustic Music in Santiago, Valparaíso, Valdivia (Chile); Buenos Aires (Argentina); Sao Paulo (Brazil); Barcelona, Madrid (Spain), Kleylehof (Austria) y Lüneburg (Germany).